Meet Mike Ray, the last of the "Founding Five" directors. Mike's love of the SVO was rather accidental and only dates back to 1995. He was living in Germany, driving a British spec Ford Capri 2.8i Injection Special, that due to import restrictions, could not be imported to the States. I was in need of a car to be waiting for me in the U.S. when I returned. I saw a Mustang for sale and knew it was somewhat rare because I had seen it in a muscle car book. I really had no idea what it was. The previous owner pointed out that it was one of three in Germany and popped the hood. 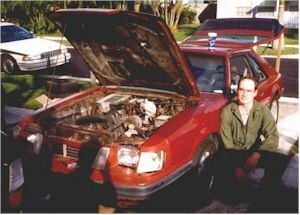 When Mike saw the Merkur motor in the `84 SVO, he knew he was in love. The SVO is the best cross between a European road car and American muscle. The car barely ran and came with a wheel barrel full of parts. A week later and a quick 120mph run on the Autobahn, his first SVO was on a boat for Texas. Mike has always had a soft spot for neglected and abused cars. His 2nd SVO was a $750 purchase out of Florida. The original owner would only sell me the car under the stipulation that I wouldn't part it! , notes Mike. This was the `84 2A duct tape mobile Mike brought to last year's Tennessee Reunion. It is currently undergoing restoration and modification; to include new body panels, sunroof, and emerald green metallic paint. Mike's also adding a few extra touches to bring the car up to the level of trim that he feels Ford should have originally offered to compete with the likes of BMW and Audi. While Mike has had only a few cars in his stable (maybe 10) he feels he represent a large portion of the "average" SVO owners who perform some-to-most of their own maintenance and upgrades. His future projects include an `88 Turbo Coupe 2.3 motor swap into an `87 Volkswagen "Westphalia" camper and the completion of his girlfriend's daily driver 9W `84 SVO (an abused 700$ Texas car). While he works by night from his home garage in Falls Church, VA, by day he's a telecommunications analyst for American Mobile Corp (Reston, VA). A satellite/cellular voice and data telecommunications company.